The Turn 1 incident at Petit Le Mans would have been a winner here too, but in the interests of variety we’ve restricted those nominations to just one category. The moment when the ding-dong LMP1 and GT1 battles intermingled at Laguna Seca. Grand Am gets a mention here with the last lap at Mexico City, a titanic struggle between Andy Lally and David Murry which would finally go the way of the Porsche pilot and hand the drivers’ title to his team mate Craig Stanton. Second slot though would go to the dramatic Mid-Ohio ALMS race, with the traditional implosion of LMP2 finding ever more bizarre ways to enter the record books – Miracle Motorsport blowing away a sure fire win after leaving Jeff Bucknum in the car longer than the allowed two hours, it was a welcome, if somewhat bemusing first win for the Mazda powered Courage of B-K Motorsports, despite the fact that the car was in the gravel trap as the flag fell. The bigger moment though was the fine 1-2 from Dyson Racing, the Lolas beating off a challenge not only from the Champion R8s but also from the Factory Zytek. The winner was, perhaps surprisingly, a class battle in GT2, with the very odd exception, a class that has been utterly dominated by Porsche for year after year. With a bizarre twist or two of fate, the deadlock was broken on both sides of the Atlantic on the very same day by two different marques, neither of which came close to repeating the feat for the remainder of the season. 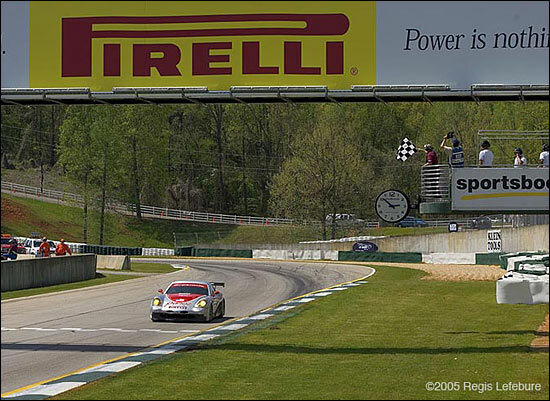 It ended, famously, with contact between the two and a spin for the Panoz, Bernhard deemed the aggressor and penalized with a stop/go, handing the lead (and indeed the win) back to Liddell and the #50 car. The incident though was a sideshow to the battle and the result. Will Multimatic revisit that form in 2006? 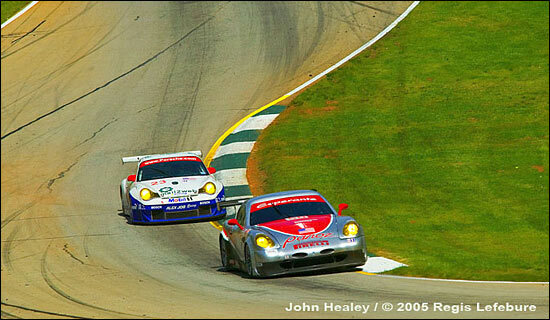 The dailysportscar.com Moment of the Year 2005 for North America is Robin Liddell vs. Timo Bernhard At Road Atlanta.